January for me means there’s always a chili or a curry simmering away on the stove. There’s no farmer’s markets to speak of so of course I’m depending on lots of beans and pantry items. When your toes are so cold all the time you need something warm and filling at the ready, and the spice doesn’t hurt, either! Its fragrance warms everything up like a magic spell wafting throughout the house. In fact, this curry was so aromatic that the mailman had to knock on the door just to tell me how good it smelled. Now that’s sayin’ something. I wanted lots of texture here and so I went with hearty ingredients. Eggplant, for one, with its great meaty seeds and velvety body. And then I used a little lentil trick that is worth its weight in gold (I mean, worth it’s weight in lentils.) Use two kinds: red lentils as a backdrop, because they just melt into the stew and provide a thick heartiness. And then brown or green lentils which stay toothsome and intact. You can serve with basmati rice, of course, but it’s also great over mashed potatoes (maybe even cilantro or scallion mashed potatoes if you want to get a little fancy.) When peeling the eggplant, you don’t have to be too precise. A little skin left on is fine, I just find that a lot of skin is a little obtrusive and it also prevents the eggplant from breaking down. 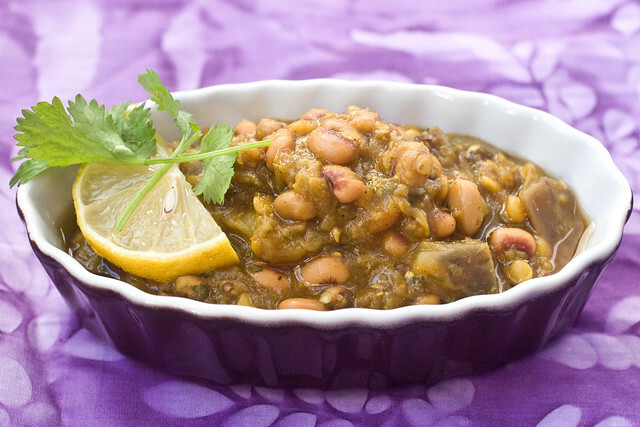 I used black eyed peas to switch things up a bit, but kidney or chickpeas are great here, too! Preheat a 4-quart soup pot over medium high heat. Saute onions in oil until translucent, 5 to 7 minutes. Add garlic and ginger and saute for another minute. Add the eggplant, curry powder, fennel seed, salt, pepper and cayenne along with a 1/2 cup of the vegetable broth to cook the eggplant down for a minute or two. Add lentils, cilantro and remaining vegetable broth. Cover pot and bring to a boil, keeping a close eye. Once it’s boiling, lower heat to a simmer and cook for about 40 minutes, until lentils are tender and eggplant is soft. Add black eyed peas to heat through, and stir in the tomato paste and lemon juice. If you’d like a thicker curry, then leave the lid off for the last 10 minutes. For thinner then just add a little extra broth. Taste for salt and seasoning. Let sit for 10 minutes or so for maximum flavor. Serve garnished with cilantro if you like. Made it tonight and it is fantastic! This curry sounds wicked good! Yum! I really don’t care for the fenugreek in traditional curry powders….can you suggest a blend of spices that omits the fenugreek but results in a similar flavor? Thanks!! Tumeric, ground cumin, ground fennel, ground coriander, hot paprika, ground mustard, pinch ground cardamom. I don’t keep fenugreek on hand so when I made a homemade curry powder that’s what I do. Perfect timing! I have been trying to find more recipes for black eyed peas. There is seriously a shortage of black eyed pea recipes on the internet. This looks so yummy! Very good looking dish. Beautiful picture! Black eye peas are delicious, I never thought of mixing it with eggplant. Anything wrong with leaving the skin on eggplants? Saw your facebook post about this when I was looking for dinner ideas last night. Made it sans fennel seed and with 4 cups of veggie broth, plus green beans. So very good! Thank you Isa! bought everything I need for this at the store today 🙂 maybe I will add tomatoes and coconut milk because I liked it so much in your chana masala recipe. I will impress my Indian co-workers with this one! Do you think this would work in the crock pot? Always looking for recipes I can assemble in the morning. I made this yesterday and it was great! I had 2 yams handy and diced them in 1/2 inch chunks then added them at the same time with the lentils. I made enough for an army and now have leftovers for the week. Yumm! I made this recipe last night for dinner and it was a HUGE hit! It makes a lot of food so I’m curious to know if this recipe freezes well if anyone has tried it??? I just made this in my crockpot. I sautéed the onion, garlic, ginger and spices on the stove first. Added the eggplant and let it sautee until covered in spice and soft. Then I put everything, including the black-eyed peas, in the crockpot for something like 3 hours. It came out great. If I’m using not-from-can black-eyed peas, should they be added at the same time as the lentils? P.S. I love all your recipes! Thank you!! No, you’ll need to cook them first. They take too long to cook in this soup. Turned out great! My eggplant was mostly bad so I used sunchokes. I added a cup of pumpkin too since I had some. I recommend eating this with quinoa. Thnks for alll your fabulous ideas! Holee Toledo! Just made this in a “It’s 10pm and I need to cook something to make the house smell faboo” and WOW! Delicious. My husband arose from a sofa nap and decided he might like eggplant after all. I added extra curry powder, extra cayenne and extra cumin for a super curry kick. Also threw in some mushrooms at the very end, since they were sitting in my fridge. Cannot wait to bring this to work tomorrow and watch the jealous faces pop into my office! I increased the curry powder significantly but otherwise enjoyed this curry. I used less cayenne, too. It makes a ton so next time I will likely half it. Thanks for sharing it, Isa! We made this yesterday and it turned out great! I put half the lemon juice suggested in the recipe because I don’t like lemon, and added more cayenne. It was really delicious. It’s probably going to become a staple of our diet. It makes a lot so that way we have something to bring to work/university for lunch during the week. Thanks for this awesome recipe! Just made this… It’s SO GOOD! Didn’t have lemons in the house, but it’s still amazing. The texture is so rich and creamy! Tasty dish & the recipe made A LOT! Tasted even better the next day over mashed potatoes. I sprouted the lentils for extra nutrition. And I added in some green split peas. It is not winter but so what! This dish is so ridiculously good! The texture, flavors – just wonderful. Thank you. I am so glad I “happened” upon your site. This is the third recipe I have tried. eating it leftover for lunch right now- crazy delicious! I made this with a few tweaks (adding tomatoes and some extra spices like garam masala and tumeric) and chickpeas instead of black eyed peas, and it was probably the best curry I’ve ever made! Thank you! Damn woman. You are awesome! This was great! I love the flavors. I didn’t have any curry powder, so I just added in garam masala, coriander, and some cardamom. I was also running low on eggplant, but had two zucchini on hand that I used in addition to the eggplant. Very filling and very delicious! Made this yesterday evening for my parents. (Who are the sort of people who say vegetarian food is boring and unfilling. They don’t really understand the concept of veganism.) Guess what? They loved it! I did omit the fenugreek and used fennel seeds instead. This is only because I’ve never eaten fenugreek, and I like fennel. The result was pretty tasty! I used tumeric, ground cumin, fennel, paprika, and ground mustard instead of the “curry powder” I had in my cabinet, and added more of the hot spices to make it spicier. I subbed BEP for garbanzo beans, added mushrooms with the eggplant, and kale later on during cooking. I actually said “this is amazing” upon first bite. It’s so hearty I don’t think it needs a bed of rice or potatoes. I will be looking forward to eating these leftovers the rest of the week! I like everything I make from your cookbooks and website, but I must say, you are a MASTER at vegan indian dishes. This and the cashew veggie korma are absolutely unbelievable! Brilliant – I made this earlier this week to use up some items. WOW! Great flavor. Thanks so much! I loved this! This is a great dish for people like me who are squeamish about eggplant. It completely dissolved with the red lentils made a great sauce. I used chickpeas and black lentils since that’s what I had in the pantry. omg i made it tonight, it was amazing!!! Best curry I’ve had in a long time! I love the way the lentils and eggplant mush down into a thick, rich sauce. Great combination of spices too. I had it with plain rice, but I think it could really stand up well to a more jazzy rice dish, such as the cranberry-cashew biryani in Appetite for Reduction. Yum! Do you use dried lentils?? Looks amazing! Sooooooooo yum. I used french green lentils and mung dahl and then threw in some fresh broad beans right at the end. Absolutely fantastic! My frozen black eyed peas got overcooked even following directions but this recipe is definitely another fav. Looking forward to making this recipe tonight! Does anyone know which cookbook this is in?